We see lots of infected ears in dogs at Jubilee especially in breeds with floppy hairy ears and ones that like water. Sometimes we can’t clear the infections with medications and we have to resort to surgery. This is Zepps procedure. The ear canal has been opened up with surgery and this improves the circulation of air, stops the environment being so humid and allows better cleaning of wax. Bacteria, yeasts and ear mites find it harder to become established so infections tend to clear. 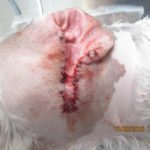 If your dog has an ongoing problem with its ears, make an appointment to talk to Gareth Torney at the surgery to discuss the benefits of surgery.